Book 2. Method/Instruction; Piano - Alfred's Basic Piano Library. Alfred's Basic Piano Library. Instructional. Instructional book. 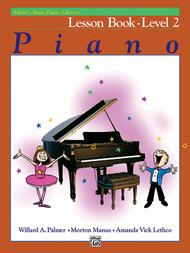 With introductory text, instructional text, illustrations, easy piano notation and fingerings. 48 pages. Alfred Music #00-2108. Published by Alfred Music (AP.2108). ISBN 0882848127. 9x12 inches. English. This easy step-by-step method emphasizes correct playing habits and note reading through interval recognition. Lesson Book 2 continues where Level 1B finishes. This book introduces dotted half notes and dotted quarter notes, plus intervals of 6ths, 7ths and octaves. Teaches greater movement of the hands, including crossing two over one and scalework. Students will also learn more about triads, primary chords, and blocked and broken chords. Songs Include: 18th Century Dance * Alouette * Blue Scales * Calypso Carnival * The Can-Can * Cockles and Mussels * The Galway Piper * Get Away! * Got Lotsa Rhythm * Kum-ba-yah! * Lavender's Blue * London Bridge * Lone Star Waltz * Malaguena * Nick Nack Paddy Wack * Ode to Joy * Oh! Susanna! * On the Bridge at Avignon * Our Special Waltz * Prelude * Red River Valley * Sarasponda * Square Dance * When You Grow Up * Why Am I Blue? I have used Alfred's prep and basic piano course for about 30 years. In my opinion, the level D book gets too difficult, too quickly, so I switch to a different curriculum for 3 book, and then come back to level 2 of Alfred. I have used many methods in my 58 years of teaching piano and I find Alfred's Basic Piano Course Books the favorite of many students. ... so I will always try to buy Alfred's books. 14 of 37 people found this review helpful. my favorite. I like the simple, uncluttered lay-out of the pages and the pictures are entertaining but not dominating. Each new piece requires more from the student and challenges them towards musical growth, but doesn't move along so quickly as to overwhelm them. I actually remember using a few of these books back when I was a little girl taking piano lessons. Some of my favorite pieces back then were from this curriculum. I would recommend this to any teacher or student of the piano. 49 of 77 people found this review helpful. April 07, 2009 It's great! I went through these Alfred books and now I am teaching from the books. I love them! It is easy for the teacher to follow and it is well rounded. 31 of 69 people found this review helpful. April 03, 2009 Makes piano fun! 43 of 75 people found this review helpful.